This e-Newsletter is dedicated to the outreach from the GEOTRACES programme, based on numerous initiatives of the past two last years and providing a better visibility of the GEOTRACES motivations, missions and research activities. Readers will discover with this letter or on the GEOTRACES website the diversity and creativity of GEOTRACES outreach initiatives. 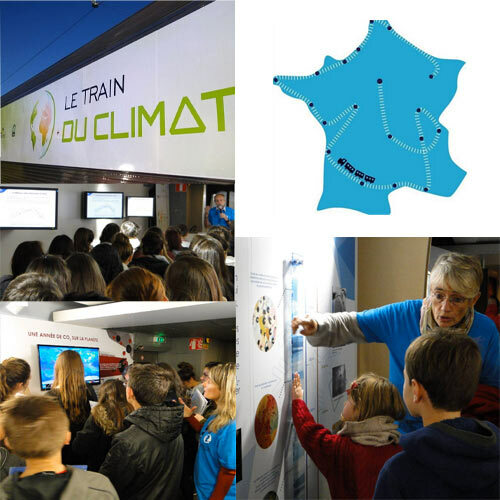 We report in the following sections on the experience of teachers at sea, follow the diving towards the abyss of a clean sampling system, listen to a webinar on “all what you wanted to know about the secret life of trace elements”... and experience the adventure of the “Climate Messengers” onboard the “Climate Train”. We decided to publish this e-Newsletter coincidently with the opening of the COP21 conference on climate change since GEOTRACES research is closely linked to understanding climate change, as is well illustrated by the research conducted in summer-fall 2015 as part of the International Arctic GEOTRACES field programme. Global warming is a considerable threat to the Arctic Ocean biogeochemical equilibrium. The International Arctic GEOTRACES programme allowed the accomplishment of 3 major oceanographic studies across the Arctic (Canadian, U.S., German) with the goal of better understanding the sources, internal cycling and sink of key trace elements and their isotopes (TEIs) in a changing world. The resulting data will be of great help for the climate modelers, because most of the flux quantifications rely on the TEI distributions. Moreover, most of the outreach material presented here was produced in the framework of these cruises. 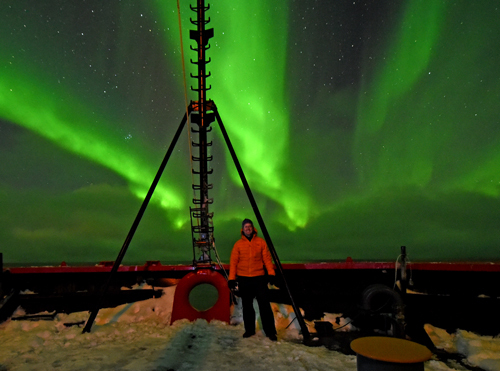 Bill Schmoker, teacher at the Centennial Middle School, Boulder, Colorado (U.S) embarked on the U.S. Arctic GEOTRACES expedition as “Teacher at Sea” sponsored by PolarTREC (Teachers and Researchers Exploring and Collaborating). The goal of PolarTREC is to invigorate polar science education and understanding by bringing educators and polar researchers together. It was my distinct pleasure to serve as a PolarTREC teacher on the 2015 U.S. Arctic GEOTRACES cruise. I volunteered to help as a bottle Sherpa for all GEOTRACES rosette casts as well as assisting other science teams whenever I could. The bulk of my onboard efforts centered around photography and outreach. I posted a new blog entry every day of the cruise along with entries detailing Seattle operations (http://polartrec.com/expeditions/us-arctic-geotraces/journals.) 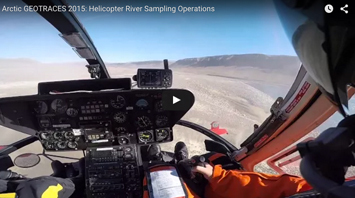 I also have edited 64 videos of different expedition aspects which are published to the PolarTREC YouTube channel. My experiences on the cruise, along with the photos and videos I took, will serve as the basis for creating new lesson plans that will be added to PolarTREC’s growing online collection of learning materials and as fodder for talks that I will give to various audiences over the next few years. Bill Schmoker, Centennial Middle School, Boulder, Colorado, U.S.
Picture: Brandon Iams, USCGC Healy Crew Member EM2. U.S. GEOTRACES participated in the “Float Your Boat” educational outreach program that provides young people an opportunity to learn about the changing Arctic, marine debris, and maritime careers through participation in a study of Arctic drift patterns, by sending their own toy boats to the Arctic. This project recreates an historic drift cask study conducted at the turn of the last century. 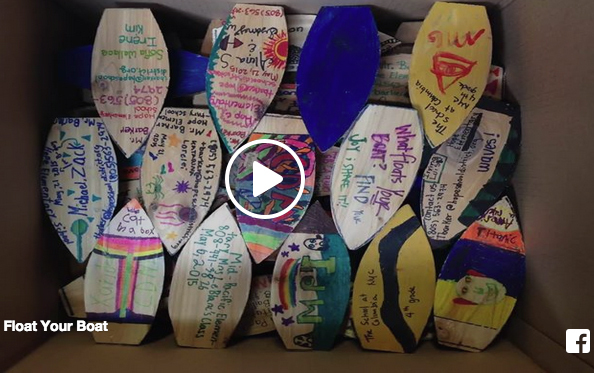 Float Your Boat aims to provide students with an understanding and appreciation of their connection with the world’s oceans. > A special note of thanks to Prof. William Landing, Florida State University, for coordinating outreach efforts for the U.S. GEOTRACES Arctic expedition. - How do key micronutrients get to the middle of the ocean? - Why should (or shouldn't) we fertilize the ocean? - What are oxygen minimum zones? How might they affect life? 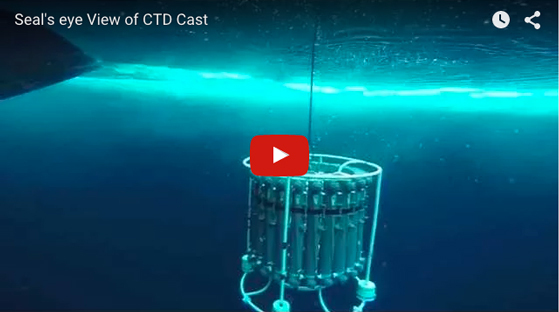 - How are hydrothermal vent fluids created and how do they move through the ocean? 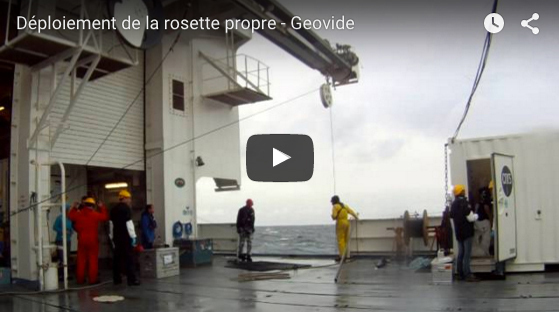 Discover an amazing collection of educational and promotional videos on the GEOTRACES website! 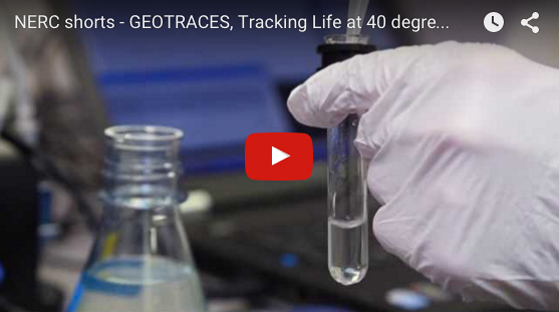 GEOTRACES national programmes develop educational and promotional videos featuring GEOTRACES research. Find a selection below. From left to right, top to down: Deployment of clean sample system equipment during the French GEOVIDE cruise (2014); GEOTRACES, Tracking Life at 40 degrees South (UK GEOTRACES, NERC, 2013); Seal's eye view of the clean sample system equipment deployed during the U.S. GEOTRACES Arctic cruise (PolarTREC, 2015); and helicopter river sampling operations during the Canadian Arctic cruise (2015). An Introduction to GEOTRACES by Dr. Ben Twining and Dr. Phoebe Lam. Oxygen Minium Zones by Dr. Carl Lamborg and Dr. Dan Ohnemus. Hydrothermal Vents and Megaplumes by Dr. Jessica Fitzsimmons and Dr. Brandy Toner. The webinar was held in April-May 2015, organized by Dr. Ben Twining and hosted by the COSEE-OS office at University of Maine. A few words on this original project realized by Catherine Jeandel and 3 other colleagues from Toulouse (France). This experience was so successful that we thought it should be shared on this outreach page. In order to publicise the climate issues as broadly as possible in France, the 4 fellows built a nomadic exhibition that was transported by a customized train from city to city during 3 weeks (6-25 October 2015) all around France. The exhibition was made in 3 parts: the first one described the natural variations of climate and how researchers detected the recent anthropogenic warming; the second one was explained the different scenarios for this century and what could happen if we don’t change our current way of life (in other words, “Business as Usual”) and the third one proposed a debate on the potential solutions. All along the travel, 12 researchers, of wide experience and diverse research fields (all related to climate!) were welcomed the visitors, guiding them, and answering to all the questions of a diverse and curious public. At each stops of the train, the local researchers and outreach centers organized “a welcome village”, proposing miscellaneous activities in the station too. Two ministers, more than 23,000 visitors from 19 cities could therefore benefit from this original initiative...and more than 40 researchers took turns and lived onboard the train in order to ensure effective communications along the different legs of this original “cruise on rails”! Willing to share your materials?